The Detroit Jazz Festival has proven to be every bit as resilient and adaptable as the city it represents. Robert McCabe founded the festival in 1980 at a time when Detroit was in the midst of being a symbol of urban political dysfunction and decay. The city is emerging from those years of decline and is on a sounder financial footing. The festival, under the sponsorship of Detroit philanthropist and Mack Avenue Records Chairman Gretchen Valade stands as an institutional representative of that civic confidence. Through the good times and bad, the city of Detroit was never without its assets. The art museum boasts one of the world’s great collections and the city remains the epicenter of the automotive world; but while other industries waxed and waned, one thing that remained constant in Detroit has been the music. The city is truly one of the world’s musical capitals. Motown likely and rightly comes to mind first when people think of Detroit’s musical legacy, but the Motor City ranks with New York, Chicago, Philadelphia and New Orleans in terms of the number of quality of jazz musicians who are natives. 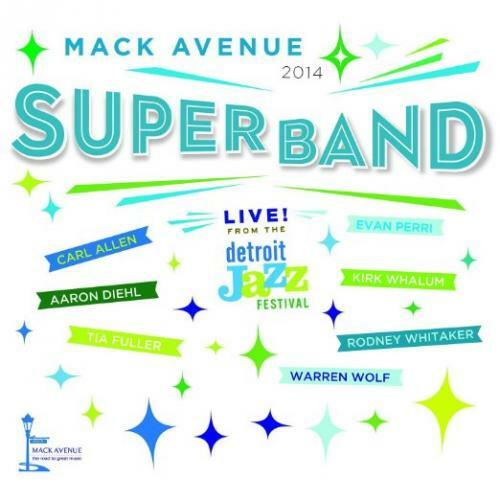 Valade and Mack Avenue use the annual festival to put on display artists who are from Detroit or are counted among the label’s acts, and that is often done through the performance by the Mack Avenue Records SuperBand that is recorded and sold as Live From the Detroit Jazz Festival. The band has performed at every Detroit Jazz Festival since 2012, and the label releases a recording of the previous year’s show around the time of the current year’s Labor Day weekend festival. The newest release, Live From the Detroit Jazz Festival 2014, features a lineup that includes a septet of top flight players, including Detroit natives guitarist Evan Perri and bassist Rodney Whitaker. The latter leads an outfit that includes returnees such as drummer Carl Allen, pianist Aaron Diehl, vibraphonist Warren Wolf, saxophonist Kirk Whalum and 2012 participant Tia Fuller. Whitaker does a commendable job of providing a platform for all of the players to shine, both individually and as an ensemble. The percussive and Far Eastern sounding “For Stephane” provides a platform for Perri to engage in some Grappelli-styled improvisation while Wolf matches his fire and creativity on the vibes. Whalum’s tenor sax provides an interesting counterpoint to Fuller’s alto on the “Bipolar Blues Blues,” a track written by Whalum, a minister who has made part of his ministry using his barbering skills to cut the hair of Memphis’s homeless population. In an introduction to the song, Whalum reminds the audience that many in the homeless population suffer from mental illness, and he wrote the song as a dedication to them. Whitaker and Diehl propel the tune’s frenetic pace by laying down a rhythm that is high tempo while Fuller and Whalum use their horns to highlight manic and depressive aspects of bipolar disorder. “The Struggle,” highlighted by Diehl’s light touch on the piano, can be viewed as a lovely ballad that symbolizes Detroit’s struggle to confront and overcome the demons of its past such as post-industrial change, political corruption and racial strife. I have had the pleasure of reviewing the previous two recordings in this series, and I began looking forward to the 2014 installment as August neared its end. Although many of the players remain the same year to year, each recording has its thematic gems. The 2012 recording, which came out in 2013, featured vocals from a young lady who we just learning about by the name of Ceclie McLorin Salvant. The 2013 record had a spiritual theme highlighted by a lovely rendition of “Speak To My Heart,” and this installment speaks to the increased optimism that is palpable in the Motor City. It’s become a wonderful annual tradition for festival attendees, and is just as much of a thrill for jazz music fans, including this reviewer. I’m already looking forward to 2015. Recommended.